The Traditional Water Gilding Technique allows the artist to lay gold leaf onto a soft clay ground that has been prepared with a natural glue, such as Rabbit Skin Glue. While this technique requires a little extra more work than the convenient size gilding, the advantage of water gilding is the fact that the gold can be burnished to a high gloss finish, after the gold has been applied to the soft poliment ground. The Sinopia Clay Boles are manufactured in house and have undergone years of development and field testing. We are proud to present such standard colors as red, yellow, white, black, green and blue. Recently the Sinopia Test Kitchen has developed two historical clays: The Classic French Red & Yellow. These colors emulate clay colors that were common in France up until the 1970's. 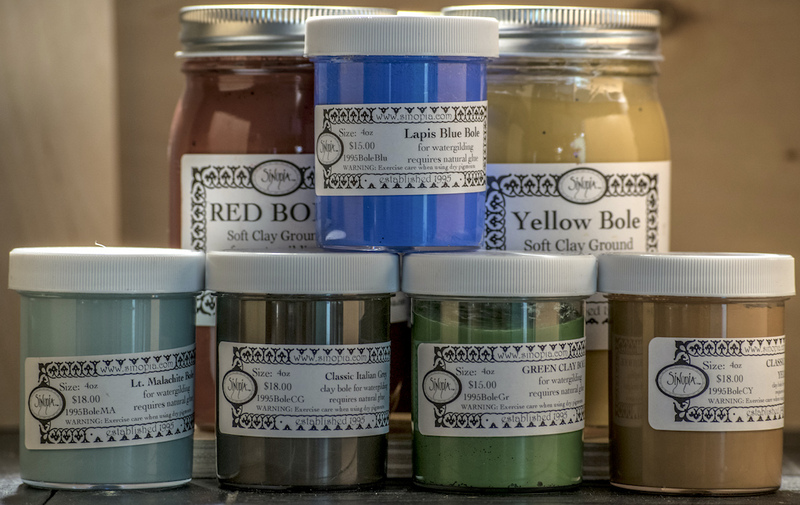 Sinopia was able to secure actual samples of these historical clays and match the hues. We are currently working on other historical colors that will be released soon.